As our plane touched down in Denpasar, Bali, I thought back to the conversation I had with a fellow traveler I met in Dimakya Island, Philippines. I asked that traveler what was her favorite place that she had visited. I had hope that her answer would be in the context of a place of unexplored natural surroundings, no signs, no street lights, pristine waters, breaking waves and white sandy beaches like “Dimakya Island!” But her answer was Bali. That was the reason for my trip. I had to see for myself a place more beautiful than Dimakya Island - a paradise island. I followed my fellow passengers who seemed to know where to go to pay the $25.00 visa fee before making our way through customs. Are they seasoned travelers or returned vacationers to Bali? I wondered. The area before customs was lined with rows of tour brochure display racks and stands. Immediately outside the customs area I found rows of money exchange stalls with clerks extending their arms through the window to lure the new arrivals with competitive exchange rates? I had been to a lot of airports, but I had never seen as many Money Exchanges as in Denpasar airport. Although my hotel offered a prearranged package that included the $25 visa fee and $20-$25 car fare to the hotel, I opted to going on my own. There were a few taxi drivers waiting outside the arrival area. The first taxi driver I approached told me that it would cost me $10.00 to get to my hotel. I rode into town to my hotel. It was early evening. Overhead the sky was gray, hinting rain. Along the way, I saw lots of familiar fast food restaurants and stores: KFC, Mini-marts, and Circle-K. The scenery was not exactly what I’d imagine of a remote paradise island. The driver spoke very good English and was very friendly. He told me that if I wanted to go on a tour or any place, I could hire his cab and him as a tour guide. As I stepped into the hotel lobby, the impression of a welcoming and tourist friendly place continued, I was greeted by warm smiles. The hotel staff said, “We upgraded your room Ms. O…. The hotel policy on upgrades is to upgrade one level above, but you’re upgraded two levels to a mini-suite with an ocean view.” Considering that I just came from volunteering in Thailand and stayed at $10/day guesthouses with dodgy bathrooms, I should have been more than happy to hear those words. But my suspicion set in. The hotel must be empty! I thought. (I noticed during breakfast that the hotel was full, a lot of visitors from Asia. There were a lot of guests attending a business conference at the hotel). I woke up the following morning to a beautiful sunrise. I walked to the beach at the back of the hotel and found it disappointing. Once again, I could not help to compare the beaches in Dimakya Island. Conrad madeup for the lack of an alluring beach by covering its grounds with a bigger than an Olympic-size pool and architecturally designed swimming pools. 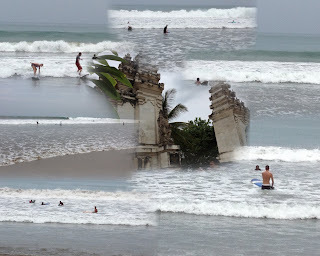 I met up with my friends from Japan for breakfast and decided to go to Kuta surfer's beach. Our cab dropped us off by the temple/gate – the entrance to Kuta surfer’s beach. It reminded me of something I read in novels about Bali’s ancient past when Bali had ruled the waves. Soon we were greeted by the sound of the ocean. And then there was the expansive beach that was dotted with tourists; vendors selling souvenirs and cold drinks; and surf boards and surfing instructors. And then there was the sea, blue and green in its not too intimidating waves. Shushing and sloshing as it met the expansive beach. And there was me adrift in my thoughts, finding comparison and differences again. The wind and the waves reminded me of my teenage days and things I had forgotten like balancing on a surf board. There were a bunch of surfing instructors offering surfing lessons and guaranteeing that we would learn how to stand on a surfboard after 10 minutes into the lesson. The swells were not that intimidating that I thought I could do it. He told us that his surfing partner would watch our bags. Oh no, not my backpack with my camera and wallet in it! I was suspicious of course. He then told me to leave it with the policeman by the gate. 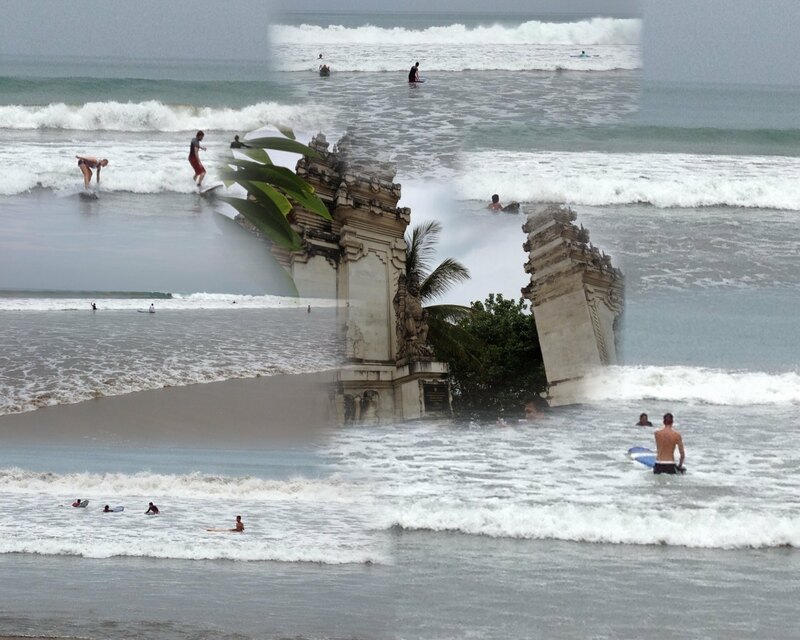 I realized later that there were no professional or local surfers in Kuta surfer’s beach. Those who were riding the waves were mainly tourists and surfing instructors. (Surfing instruction is an important business and part of watching the tourist’s bags come with the business. So they’re inherently honest). I had windsurfed but never rode the wave (surf-surf) before. On my first attempt at standing on a surfboard to catch the wave, I fell hard on my face and swallowed a lot of salt water. I immediately gave up the surfing lesson, I just used my surfboard to float. After the surfing lesson my friends decided to go to the Kuta shopping mall and have lunch there. I decided to stay and frolic at the beach. As I was about to leave the beach I was approached by vendors, bantering and insisting that I buy something or whatever ware they were hawking. My unwavering desire to support the local vendors got the better of me. I agreed to get a henna tattoo. The tattoo man gestured out for me to go under the big tree. I was suddenly swarmed by vendors. An older woman came to massage my back while I was getting my tattoo. Another woman started giving me a foot massage. The woman who earlier tried to sell me a sarong that she priced from $8.00 and lowered to $2.00 reappeared. I didn’t know how it happened but I ended up paying $5.00 for the sarong. When another vendor found out how much I paid for the sarong, she tried to sell me a handcrafted necklace for the same price. I discovered that their pricing was not about the actual value of the goods, but how much the buyer was willing to pay. “It’s not fair Miss, you bought something from her…you should buy something from me too”, another vendor complained. Suddenly, it was no longer about pricing, but about fairness. Soon they were no longer selling me something, but getting to know me. They asked where I was going, where I came from and what my name was (in that order). I began to understand why everybody, not only the cab drivers, asked the question, "where are you going?" They want to take you around or know someone who could give you a tour of Bali. It's part of the business. More vendors congregated under the big tree where I was getting my henna tattoo. Perhaps to rest from the afternoon heat. They started to talk to each other in their own language. I listened to their conversation that I could not understand. I tried to understand them by looking into their faces. Soon the vendors lingered around like I was their long-lost relative. I was no longer talking to strangers. They were undeniably welcoming and kind. “This is what travel is all about!” I thought. After the beach, I decided to check out the Kuta market. I turned a corner and found a street, more like a promenade lined with parked motorcycles. Suddenly I was stopped by a smiling young man who handed me a coupon. “What is he trying to sell now?” I thought. “Scratch it Miss”, he said. I obliged. He looked at what the coupon revealed and started to jump. “You win! You win the biggest prize, free accommodation!” he exclaimed and looked so sincerely happy for me. When I found out that it was about a vacation/time-share promotion, I dismissed the idea and hailed a cab to return to my hotel. I went back to Nusa Dua to have dinner with my friends. We talked about our day’s experiences over dinner. I was trying to share my disappointment over the beaches in Nusa Dua and Kuta when the restaurant owner heard our conversation and came to talk to us. “I still have to find a white sandy beach, like those featured in movies.” I said. “Oh I know what you mean…in ‘Eat, Pray and Love’ with Julia Roberts." That was filmed in Amlapura. You can hire a cab to take you there. Bali is not about the beach, you’ll find better beaches in Thailand. Bali is a place of culture", he said in heavily accented Australian. Tomorrow! I said. The following day, I woke up to the rustling sound of coconut palm trees and the sound of heavy rains splashing like waterfalls into the pools. I cancelled my plans on going to Amlapura and decided to lie by the pool at Conrad instead. “Oh the irony! I’m in Bali, the island of sun,sea and sand. And here I am spending my time by the pool in the rain.” I thought. But I had not given up on my search for paradise. It was late in the afternoon when the rain stopped. I took a cab to the Four Seasons Resort in Jimbaran, a place famous for seafood dinners by the beach. The seafood restaurant was quite a walk from the Four Season’s open air lobby. The host offered to get me a ride to the restaurant. But when I saw the view, I decided to walk. The Four Seasons turned nature into a landscaped garden with a remarkable view of the ocean. I descended the narrow steps and walked the well-designed paths to the restaurant by the beach. Lured by the sound of the waves, I passed the architecturally perfect pools and skipped the Four Seasons restaurant. I kept walking to the beach. Farther on I found seats and tables in the open beach area and clusters of restaurants catering to the locals and tourists. I decided to eat there instead. I bought grilled corn for 50 cents from a vendor to compliment the grilled prawns I ordered from the restaurant. The food was fresh and delicious in its simplicity. I ate under the open sky while listening to the waves. As the light began to fade, I could not help but smile at the irony on what I had walked too far to find.